The practice of hunting with birds of prey dates back to antiquity. According to the research of the great Soviet ornithologist G. P. Dement’ev, the first mention of birds of prey in Central Asia was when Urus Inal, the Kyrgyz Khan, presented shumkars (gyrfalcons) to Genghis Khan at the end of the 12th century. 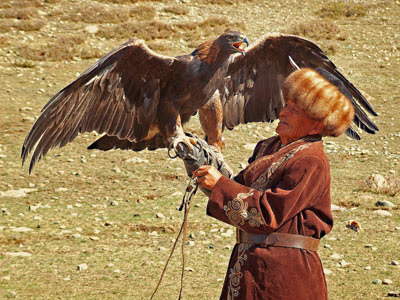 Berkutchi – hunters with golden eagles - have always been highly respected in Kyrgyz society, as they were able to provide enough meat and pelts not only for a family but for a whole village. This type of hunting was an indispensable part of everyday nomadic life. At great occasions it was also an opportunity for hunters to demonstrate their skills to their community or tribe. The skills of bird taming and training were passed down from one generation to another. This art was mostly the prerogative of wealthy people, as the training and keeping of hunting birds was costly. Hunters used, and still use, diverse birds of prey. Hawks are adaptable to various hunting conditions and become accustomed to a master quite quickly. Saker falcons are popular, especially for their easy and accommodative disposition. But in Central Asia, berkut, (golden eagles) are preferable and highly prized. The magnificent mountain localities from the Tien Shan range to the Himalayas provide a home to the berkut, which takes its name from the golden feathers at the back of its head. The berkut generally hunts hares, foxes and lynxes but bigger and well-trained birds can kill a wolf. 1. Birds in the wild are caught by nets. These birds possess a great store of hunting skills transmitted from their parents. Those fledglings taken from the nest become accustomed to people quickly. Usually, a novice berkutchi learns how to work with hobby falcons or sparrow hawks, and only when more experienced, does he train saker falcons and golden eagles. Firstly, a bird has to be tamed. At the very beginning, the hunter spends all his time with the eaglet. The bird is placed on a continuously swinging perch and, in order not to fall down, the eaglet has to balance constantly. Concentrating on this activity, the bird gets tired but cannot fall asleep, and thereby becomes accustomed to its master quicker. The eaglet is fed 4-5 times per day. Next, the bird is taught to fly down to the hand of the berkutchi. The birds of prey are trained by means of dragging the target, usually a stuffed fox fur fastened to a rope. Correct feeding is one of the main conditions for favourable raising and training of hunting birds. Different sorts of meat can be used for feeding, such as beef, fox and mutton; pigeon meat is considered a delicacy. But there is an indispensable condition: the meat must always be fresh as it prevents the eagle from getting sick. Overfeeding has a negative effect not only on the hunting - fat birds become lazy and lose their will to hunt - but it can be also kill the bird. 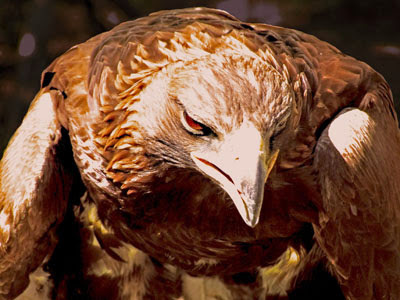 To keep the bird fit, a golden eagle is given about 800 grams of meat per day. During the season the bird is fed after the hunting activity. The life expectancy of a golden eagle is 40 years. Berkutchi prefer female birds as they are bigger and therefore more suitable for hunting wolves. The average weight of a golden eagle is 5-6 kilograms. With such a weight it can be difficult for berkutchi to walk and carry the bird for hours, especially in the mountains: berkutchi prefer riding during hunting sorties. There is a special implement to carry the eagle, called “baldak”. This is a sort of Y-shaped rest, the foot of which is fixed on the saddle and the upper Y-shaped part supports the arm of the hunter while holding the eagle. Berkutchi wear a sophisticated glove that is made from pieces of rawhide leather with felt lining. This glove protects the hunter’s arm from the sharp talons of his pet. One more item of the hunter’s equipment is the tomogo. Tomogo is a leather hood that is put on bird’s head. 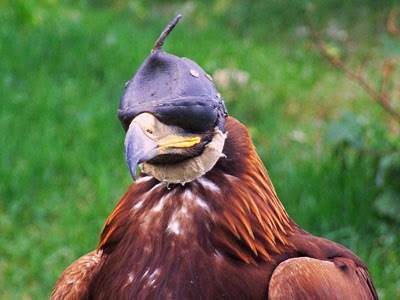 It covers its eyes and is used to calm the eagle. With this hood, the bird looks impressive and menacing. Out of the hunting season, a berkutchi has to spend at least 2-3 hours with his pet (maintaining and enriching the bird’s aptitudes); otherwise the bird becomes quickly estranged. Intensive training takes place just before the season in September and the beginning of October. The hunting season starts in late October, and lasts for about 4 months. Expert berkutchi and eagle, it is claimed, are able to get 25 foxes, 3-4 lynxes and a few wolves. This exceptional national skill, one of the most remarkable traditions of Kyrgyz nomadic culture, is gradually dying out. In the Issyk-Kul region there are still a few masters who do their utmost to pass these valuable eagle-hunting skills to disciples. To renew interest in traditional nomadic practices the annual Salburun festival was started in 1997. 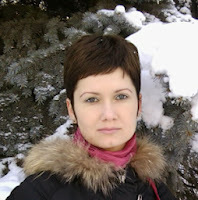 (Salburun in Kyrgyz means “hunter’s zest”). The festival is a series of competitions and activities celebrating the nomadic way of life. Events such as ulak tartysh (buzkashi), dog racing, and archery are held. Of course the highlight of the festival is eagle hunting. Passengers on an Uzbek Journeys tour to Kyrgyzstan certainly have the opportunity to view an eagle hunt if they wish.